Other than feasting during holidays, have you been staying out late, partying and drinking lots of booze? Don’t you hate the horrible headache or nausea feeling that you get, once you wake up the next morning? This detox smoothie is created specially for you party-goers out there and hopefully, this will help to hydrate, rejuvenate and clear the toxins from your systems! This is defnitely going to turn out GREEN! And Taa-Daa! Your potion is ready !! The previous detox blend was pretty potent (and very spicy!). I don’t think someone who just woke up with parched lips and a heavy head would enjoy a strong-tasting drink like that. Many years back, I read that taking a Vitamin B-Complex pill just before sleep helps to prevent hangover the morning after. I tried and it actually worked! But I didn’t use this method often because I don’t feel ‘safe’ to have a supplement messing with the alcohol in my system, if this makes sense. Now I don’t drink much anymore, I don’t exactly need this remedy. But, I know that Cucumbers contain high amounts of B Vitamins. So, adding them to this green smoothie should work just fine for you too! Cucumbers also help to replenish electrolytes and this means, you will feel more hydrated. Some have claimed that eating a few slices of Cucumber after drinking and before bed will prevent hangover the next day. Let me know if it works? Broccoli helps in your detoxification process and this is especially important after a night of drinking. It also has high Anti-inflammatory and Antioxidant benefits. 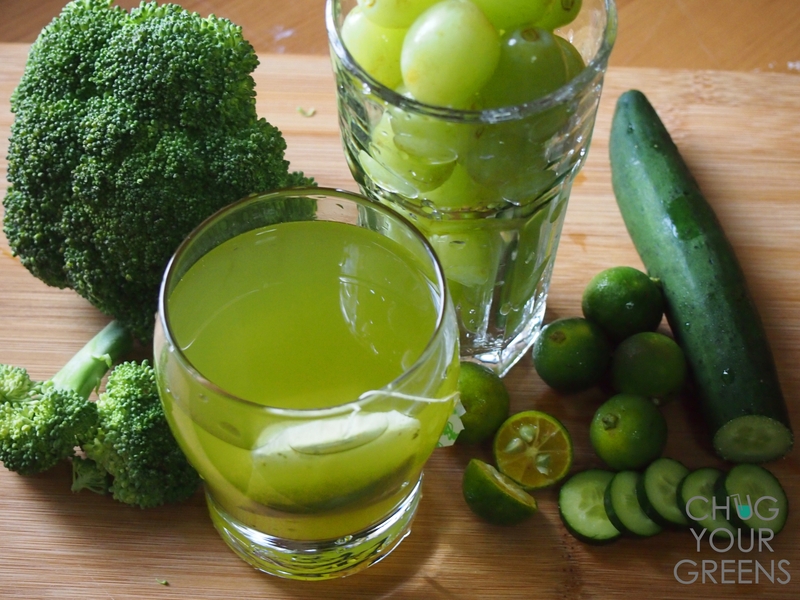 Green grapes and Lime juice both contain high amounts of Vitamin C and are also great sources of antioxidant. Not only are they effective in speeding up your recovery, they give a sweet, appetising flavour to your drink and instantly helps to wake up your taste buds. If you try and search for hangover remedies, a lot of articles will suggest drinking Green Tea due to it’s high amount of Antioxidants and detoxing effects. If your hangover is extremely bad and you really can’t move around much… at least get yourself a warm cup of green tea and add some lemon/lime juice in. Your queasy tummy will thank you for that. 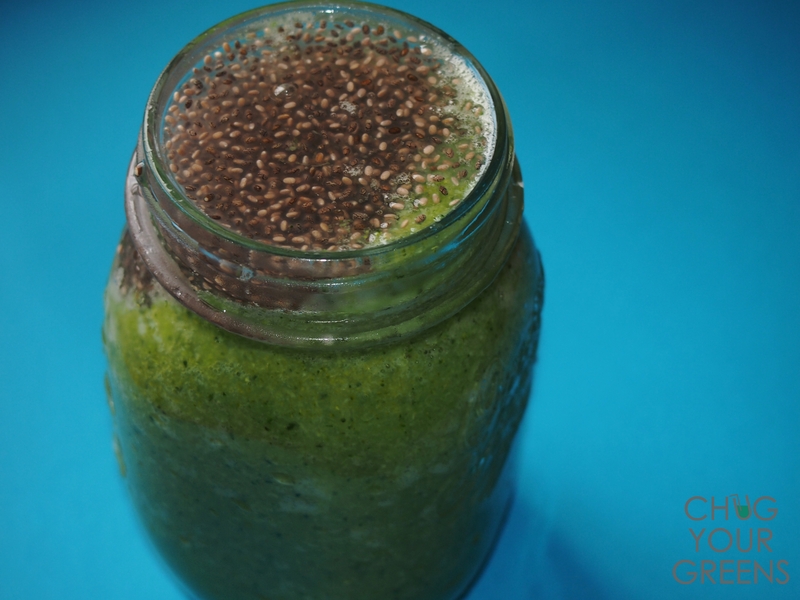 This green smoothie would be perfect for the morning after a big party and especially useful for nursing that nasty hangover. It is refreshing, sweet and very quick to prepare. The ingredients are all high in Vitamins and effective for clearing out the accumulated toxins. I truly enjoy this drink (even though I wasn’t drinking the night before lol ). Top it up with some Chia seeds (mine was soaked beforehand) to fill yourself up and help you retain more hydration in your body. Hope this post helps you to get rid of that heavy head and remember… Drink LOTS of water too! Look at all that green! I love it.